Sign-up and receive Property Email Alerts of Residential Estates in St John'S Village, Howick. 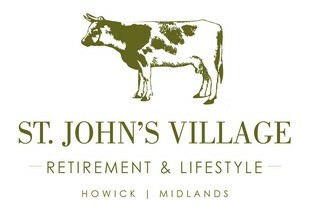 St. John's Village is set to be the Midlands' premier retirement and lifestyle estate, situated on the green slopes at the edge of the historical town of Howick. Based on the innovative concept of agri-urbanism, developed in the UK and pioneered by Prince Charles with his visionary Poundbury Village in England, St. John's Village combines a diversity of upmarket residential sites and cottages within various "pocket villages" with organic agricultural elements and eco-friendly practices surrounding them. The architectural code is based on picturesque traditional Natal veranda designs, with face brick, stone and plaster finishes. The environmental emphasis is on a sustainable 'green' way of life, with solar geysers, rainwater harvesting tanks, and organically grown fresh produce planted in communal garden areas (including a vineyard). St. John's Village has been designed to offer a carefree, rural lifestyle for both retirees and young families looking for a safe, comfortable and convenient space to live. A dedicated security team will monitor access controlled points of entry and electrified perimeter fencing, whilst residents enjoy an active lifestyle at the bowling green, tennis court, fishing dams and swimming pool. The retirement component is of utmost importance and retirees will have an array of convenient amenities, such as a library, house-keeping service, restaurant and an 8-bedroom healthcare facility. Not to mention the Howick Mediclinic being less than 3 km away. More than just an 'old age home', young families can finally find affordable estate housing in an area that boasts schools such as Grace College, Hilton College, St Anne's & Michaelhouse. A shopping mall and boutique hotel is on the cards and with the Pietermaritzburg CBD a mere 20 km away, it provides a country lifestyle to urban professionals. Follow Karkloof road till you see the turn of the St Johns Shopping Centre and find the estate entrance at the top of the road.